Singapore Airlines subsidiary Scoot has seen rapid growth throughout Asia and Australia, and now the Changi-based carrier has shared plans to launch its first US-bound route, with one-stop service from SIN to Honolulu, Hawaii. The new flight, which will be operated by Scoot’s 787-8 Dreamliner, is expected to launch on December 19, 2017, flying from Singapore to Honolulu with a stop in Osaka. It’ll also be possible to book each leg individually, giving you more options between Singapore and Osaka, and between Japan and Hawaii. Economy fares from Singapore all the way to Honolulu are available for $555 SGD (about $407) round-trip if you book by October 8. Meanwhile, economy fares originating in Honolulu are a bit more, starting at $490 round-trip. Business-class fares are around $1,800 round-trip, but vary depending on the date. 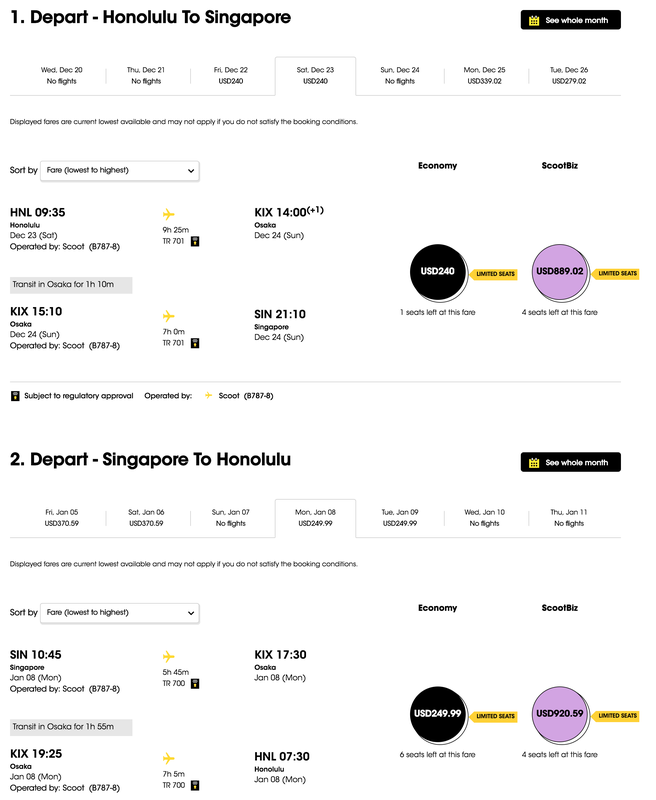 With one-stop flights from the West Coast to Singapore currently available for as little as $432 round-trip on other carriers, this new Scoot flight isn’t a tremendously appealing option for travelers based in the mainland US. 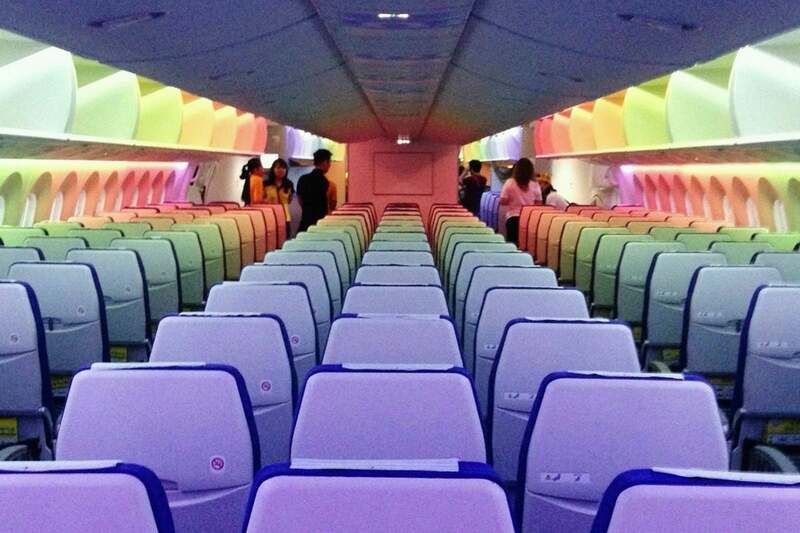 However, if you’re thinking about pairing a Hawaii vacation with a trip to Japan or Southeast Asia, Scoot’s Dreamliner could be a cost-effective option indeed. I flew Scoot in February on a $190 ScootBiz fare. The flight from Taipei to Singapore was only four hours long, but I found the 787-9 to be comfortable enough, and my business-class seat was similar to what you’d find in domestic first class on US-based airlines. And at just $190 one-way, it was quite the steal. Scoot offers Wi-Fi and streaming entertainment, but there aren’t seat-back displays in business class or coach, so remember to bring your own device. Entertainment is currently priced at $11 per leg — assuming the same pricing structure remains, you’d need to pay $44 for entertainment on a round-trip from Honolulu to Singapore. Streaming content is free for business-class passengers. 24 hours of Wi-Fi is available for $22. All of Scoot’s Dreamliners have power outlets in the seat, so you don’t need to worry about your battery lasting for the entire 16+ hour (Westbound) trek. Since Scoot is a low-cost carrier, be prepared for other fees as well. As this new route falls under Scoot’s “Extra long-haul flights” category, per-direction baggage fees start at $50 when purchased in advance or $80 at check-in, while seat selection ranges from $15 to $103. Meals range in price from $11 to $18, and you’ll even pay for in-seat power when traveling in economy — $9 for the one-stop flight from Hawaii to Singapore. So be sure to take all of these into account before purchasing a ticket. Have you had a chance to fly Scoot?